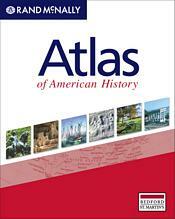 Rand McNally Atlas of American History. This collection of over eighty full-color maps illustrates key events and eras, from early exploration and settlement, expansion and immigration, to U.S. involvement in wars abroad and on American soil. Introductory pages for each section include brief overviews, timelines, graphs, and photos to quickly establish a historical context. For only $5, you can add this atlas to any Bedford/St. Martin’s text: The American Promise, The American Promise Compact Edition & the Value Edition of The American Promise (Roark et. al. ), America’s History and America: A Concise History (Henretta et. al.) and Who Built America (The American Social History Project). For package ISBNs and prices, please contact your Bedford/St. Martin’s sales representative.